257 pages | 30 B/W Illus. 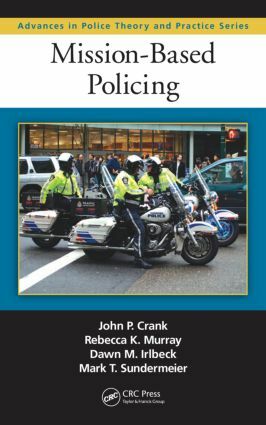 The research revolution in police work has uncovered a multitude of data, but this contemporary knowledge has done very little to change the way things are done in most police departments across the U.S., where the prevalent form of policing is based on the traditional model of district assignments and random preventive patrol. Mission-Based Policing unveils a new paradigm that transitions policing away from practices that while long-held, have inadequately dealt with serious crime. Outlining a specific methodology for police redeployment, the book highlights the importance of hot spot presence, command integrity, and fundamental organizational change that has as its end goal long term reduction in crime statistics through effective crime prevention practices.
" … will likely generate a degree of interest in academia as well as contribute substantially to the ongoing conversation on crime-control strategies in urban areas." John Crank is a Professor of Criminology/Criminal Justice at University of Nebraska at Omaha. He has written extensively in the area of policing and has received the Outstanding Book Award from the Academy of Criminal Justice Sciences in 2003 for his work titled "Imagining Justice." Dawn Irlbeck is an Assistant Professor of Sociology at Creighton University. She teaches courses on the criminal justice system, American cultural minorities, social stratification, as well as other courses in sociology. Her primary research interests include racial profiling, policing and minority communities, Latino police officers, and ethnic identity formation. She has recently published on racial profiling and vehicle searches, as well as variations in ethnic identity among Latino police officers. Rebecca K. Murray is an Assistant Professor in the Department of Sociology/Anthropology at Creighton University, where she helps facilitate the criminal justice policy track. She has published work looking at the effect of various urban structures on crime and critiquing spatial methodologies. Her most recent work examines the interaction between community groups and formal mechanisms of social control, and the effects of police policies on wrongful convictions. Mark Sundermeier spent 25 years with the Omaha Police Department, retiring as a deputy chief in 2009. During that time he also served as a reserve deputy sheriff with the Douglas County Sheriff’s Office. After retiring, Mark joined Metropolitan Community College, where he helped to form the MCC Police Department, Nebraska’s newest police department. Mark is an adjunct criminal justice professor at the University of Nebraska at Omaha, and is a security consultant with a variety of companies and individuals.